New Website for DECK DecisionWare Launched! On the 10th anniversary of incorporating Spieker Point, we are very pleased to launch a website detailing our product – DECK DecisionWare! They don’t fully incorporate the business processes that make your business great; they force you to adopt the software’s internal processes, causing all sorts of “change management” problems with your staff, and external to your customer. The rip out all of the sub-systems that you have bought or built over the years. Even if the sub-system is “best-of-breed” for your business, it gets thrown out to be replaced with the sub-system that fits into the ERP’s ecosystem. The ERP ecosystem is difficult to evolve over time as your business changes, or sub-systems grow old (and, just like machines and vehicles, software systems grow old too). 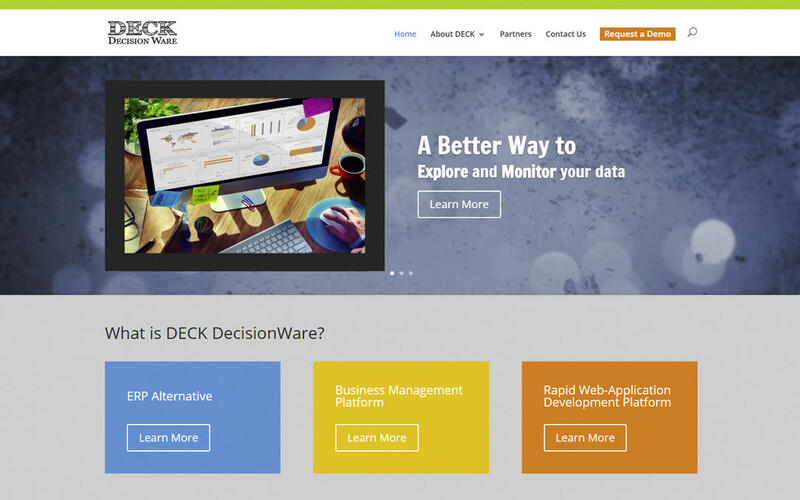 DECK DecisionWare is an amazingly innovative in how it approaches Business Management. Borrowing from our experience with large financial institutions, we’ve architected DECK DecisionWare to “connect” to the data inside of important sub-systems in your business. This protects your capital investment in systems that are working well, allowing you to organically grow/change the sub-systems when you and your business dictate the need for change. With DECK DecisionWare connected to the “data islands” inside of your business integrating the data together, your management team now sees a complete picture of the business. With analytics feeding dashboards and reports, DECK DecisionWare gives you a much clearer understanding of whats happening. This is what a management team is looking for when they start to grow in their need for more information. Up until now, the only thing available to them was an ERP system. With all of the cautionary tales associated with ERP systems, growing in this direction is a huge unknown causing a great deal of angst. With DECK DecisionWare, both the system cost and the amount of change are much smaller and easily managed. If you have already mapped out your internal processes, then DECK DecisionWare “inhales” those processes directly inside of it. DECK DecisionWare then ensures that all of the things that have made you great are followed by the entire company, giving your customers a common experience when dealing with your growing company. As your company grows, your needs change. You’ll outgrow IT systems that were ideal when you were smaller. DECK DecisionWare grows with you, allowing you to “change-out” those sub-systems for modern ones, and “wire” the new ones back into the central management platform – DECK DecisionWare – to maintain your common dashboards, reports, workflows and policies without impact from the growth. Often businesses have regulatory constraints they need to follow. Perhaps they are external – governmental or industry specific, or perhaps they are internal – things the management team wants to ensure is followed (a franchise, for example) or a large company with strict business practices. DECK DecisionWare has a large compliance engine built into it’s core. Policy constraints can be added or changed as your company grows – perhaps year-over-year as lawyers review Collective Bargaining Agreements or other legal obligations. What keeps you up at night in your business? Contact us to see what DECK DecisionWare can do for you!